Darcy Jones doesn’t remember anything before the day she was abandoned as a child outside a Chicago firehouse. She has never really belonged anywhere—but she couldn’t have guessed that she comes from an alternate world where the Great Chicago Fire didn’t happen and deadly creatures called Shades terrorize the human population.Memories begin to haunt Darcy when a new boy arrives at her high school, and he makes her feel both desire and desired in a way she hadn’t thought possible. But Conn’s interest in her is confusing. It doesn’t line up with the way he first looked at her. As if she were his enemy.When Conn betrays Darcy, she realizes that she can’t rely on anything—not herself, not the laws of nature, and certainly not him. Darcy decides to infiltrate the Shadow Society and uncover the Shades’ latest terrorist plot. 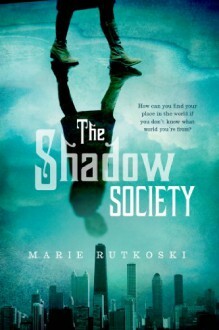 What she finds out will change her world forever . . .In this smart, compulsively readable novel, master storyteller Marie Rutkoski has crafted an utterly original world, characters you won’t soon forget, and a tale full of intrigue and suspense. Calling it quits at 200 pages. Not for me. I made it 200 pages but I'm just not connecting with the main character and not that interested in the plot, I'm finding it very boring and repetitive. DNFing. http://Nightlizard.booklikes.com NightLizard's Cave 4.0 Thumbs up for smart female characters! text Thumbs up for smart female characters! I read this over the weekend. I'm not sure what I think about it. I will attempt to write a review. It wasn't bad. I'm not sure if it was good. It was mostly meh. However, I think that might be a me problem, I'm not really sure. Meh. I just loved it.I think there was something new to this book...something I haven't already seen and that was a big fat plus for the plot.I also liked characters and the writing style of Marie Rutkoski.Recommended!